In accordance with the Faculty Plan submitted to the Board of Trustees in December 2012, The Irwin S. Chanin School of Architecture launched two 2013 Summer Programs in Architecture to extend the reach of the School's preeminent position in architectural education. The Introduction to Architecture course was designed to provide college students who are or have been pursuing other disciplines with a comprehensive introduction to the culture, practice and history of architecture via the unique studio culture that has characterized and fostered the pedagogy of the School of Architecture for over thirty years. Many of the students in this inaugural class were from the tristate area, but students also traveled from other states and Canada. Students were pursuing or had completed undergraduate degrees in Engineering, Liberal Arts, and Finance among others, and were interested in the course to develop a portfolio for admission to graduate programs in architecture. Some students came with little prior knowledge of architecture while others had experience interning for architecture firms and interior designers. The breadth of diversity in experience inspired a dynamic studio environment while providing students with a challenging and supportive arena to analyze, discuss, and make architecture. 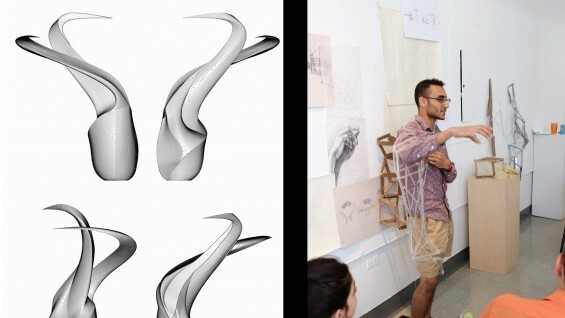 The Masterclass in Advanced Digital Architecture provided an intensive studio environment with a rotating faculty leading weekly workshops on architecture. The Masterclass students also had a range of prior experience in the study of architecture and all shared an intense desire to push the field of digital architecture by challenging both assumed ideas and modes of operation. Students in the class came from across the nation as well as from Tehran, Iran. Selections of projects from the 2013 Summer Programs in Architecture will be on view on The Cooper Union website in the coming weeks.